The poster of Nick Enright's stage show Daylight Saving in which Gerda had a role. Both Gerda's parents were involved in amateur acting, but it took some time before Gerda herself became interested in the theatre. In 1958, she joined her parents on their move to London. Gerda did not do any acting when there (she worked as a draughtsperson), but saw nearly every stage plays that were running at the time. After having returned to Australia in 1961, she joined the Melbourne University's Graduate Society and some of their amateur stage plays, at the same time as she worked as a draughtsperson, again, at the Victorian Health Department. Some works she was in during this pre-professional era were School for Scandal by Richard Brinsley Sheridan and The Cherry Orchard by Anton Chekhov. She was soon spotted by a director who urged Gerda to audition for the professional stage play A Woman in a Dressing Gown. She received one of the main roles and joined the ensemble (including among others Googie Withers) on their tour around Australia and New Zealand in 1962. Gerda herself later claimed that she got the role because the producer was after a good pair of legs - 'and he just happened to like mine', she said. Other theatre work are Nick Enright's Daylight Saving, where Gerda starred together with Prisoner-star Maggie Millar, and Mary Lives!. In 1987, Gerda sang in the musical Nine that toured the globe and even visited Broadway in New York. She played the mother of fellow Bluey-actor John Diedrich. He had the main part in the production as Guido, a man tormented by the fact that he is forced to choose one girl only among the world's women. Another actor in Nine who Gerda had acted with previously was Caroline Gillmer who had characterised Helen Smart during Gerda's early Prisoner career. Peta Toppano, who had acted in the early ears of Prisoner, before Gerda's performance as Ann Reynolds, also had one of the major roles in the musical. 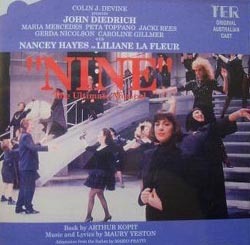 The CD-cover of Nine's official recording.